Social media is the fastest growing online marketing sector. SEO and Social Media Strategies are both critical parts of the Marketing Mix. Social Web Media offers relevant social media optimization services for your business type. 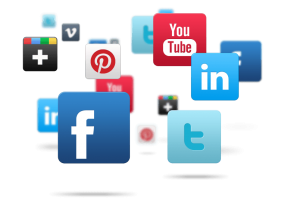 Social networking through effective tools such as Facebook, Twitter, LinkedIn, Pinterest, MySpace, Google +, digg, flickr, etc., help you to engage with your target audience and/or foster professional relationships and networking. Social Web Media will work with you to decide where to concentrate your social media efforts, depending on your product or service. We begin by gaining a sound understanding of your industry, goals, and audience demographics and competition. Some social media sites such as LinkedIn are more suited to professional networking while others such as Facebook are where you will find more interaction with consumers. Your social media presence should be relevant and consistent and that is hard to achieve if you try to cover every network. When was the last time you went on a Facebook business page and saw the last post was two years ago? AdWords, Google’s online advertising program, lets you reach new customers and grow your business. Social Web Media can provide a plan including where your ad appears, set a budget you’re comfortable with, and measure the impact of your ad. There’s no minimum spending commitment. You can pause or stop anytime. Increase in-store visits – AdWords can help you raise awareness of your physical store and get more potential customers to visit. You can target specific locations so that your ad shows only to people searching in or around your area. Increase phone calls – AdWords can help you generate more phone calls to your business. You can display your phone number with your ad, making it easier for people to call you on the spot. And mobile users can call you with just a click of a button. Drive online sales – If you sell products online, you can use AdWords to generate more orders. Put your ad in front of people right when they’re searching for that product, and link them directly to the page where they can purchase it. You can also track when clicks on your ad lead directly to orders on your website. This helps you measure and improve the return on investment (ROI) of your advertising. Drive online leads – If you want potential customers to fill out a contact form on your website, you can have your ad link directly to that page — increasing the chances of a click becoming a lead.